This was a nice weekend. My family and I spent the Saturday morning at Chili Fest and then went over to our local small farmer's market and I bought a half gallon of grass-fed organic milk that my kids absolutely love. I love relaxing weekends in the last summer/early fall. If I was to pick my favorite time of the year it would without a doubt be fall. The temps are cooler and there are tons of local events that my family and I love going to. This is also the season when I begin to change my menu plans around. Out go the salads and burgers from the summer and in come the soups, stews and chili. One of my favorite dishes that I make frequently in the warmer months is stir-fry. My two boys love stir-fry and enjoy helping me prep all the vegetables. Last week I tried a new recipe for Spicy Turkey Thighs and Bacon Stir-Fry from Everyday Food, which promised 30 minutes of total time and to be inexpensive on my food budget. This recipe has 11 ingredients. It takes 30 minutes of total time, all of which is active and makes 4 servings. I did end up having to go to two separate stores to find all the ingredients. Luckily the grocery store in the suburbs has a large ethnic foods section and they had the sambal pelek so I didn't have to make any ingredient substitution. I did chose to serve the dish over brown rice. I have stopped using white rice and my boys actually have learned to love brown rice, so as I always do I substituted. Additionally, I used honey instead of light-brown sugar. Most importantly I am never able to find turkey thighs in my area, so I substituted turkey breast cutlets. My turkey took longer than the recipe suggested to fully cook, in total I would approximate it took 15 minutes. This might have been due to the fact that I cut my turkey a little thicker than the recipe probably would suggest. I followed the remainder of the recipe as written. I was worried that this dish might be a little too spicy for my two boys, but they loved it. I really liked the chili sauce. Previously I had never tried that particular type of chili sauce and both my husband and I really enjoyed it. Of course my family loves any dish with bacon and it was interesting making a stir-fry in which it was a main ingredient. I love that this recipe goes together quickly and the prep work is very easy. Overall a quick and inexpensive weekday dinner option. 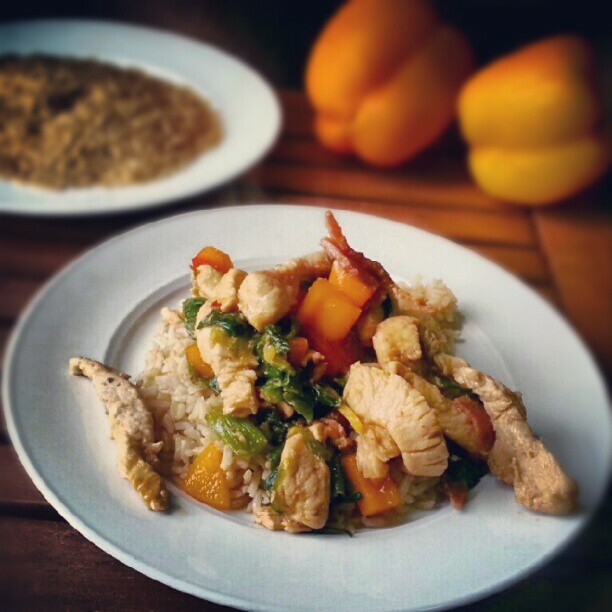 For the recipe go to Spicy Turkey Thighs with Bacon Stir-Fry. Sounds good. I have never tried to stir fry anything but bacon in anything sounds good. Perhaps I can try this with shrimp as the meat instead. Stir-fry is really yummy and everything is always yummy with bacon :) You could definitely use shrimp instead of the meat and it would still work well.